Typical venturi pump from a Wagner manual powder coating gun system. If you’ve been shopping for a manual powder coating gun, you’ve already seen the terms “box-fed” and “hopper-fed.” In this article, we’ll explain what those terms mean, how they affect your powder coating process and how picking the right gun configuration can dramatically improve your results. Every professional quality manual powder coating gun has an integrated delivery system for preparing the powder and bringing a steady stream to the application gun. The powder flows through the hand-held application gun as it is sprayed onto the part being coated. Both box-fed and hopper-fed delivery systems provide powder to a venturi-type powder pump, but these two preparatory feed systems have different attributes. You’ll need to consider which system will work best for you before buying a new powder coating gun. Wagner box-fed powder gun with pick-up tube shown outside of a box of powder. A box-fed powder coating gun draws powder coating media directly from the box provided by the powder supplier. A platform holds the powder box at an angle on a stand below the gun’s controls. A powder pick-up tube is then inserted into the powder in the box. The pick-up tube hangs vertically and usually has a small amount of compressed air delivered to the tip area to break up any compacted or clumpy powder. This helps assure uniform powder flow. The tube routes the powder up to the venturi powder pump, which sends the powder to the gun itself. During operation, the platform which holds the box constantly vibrates. This vibration causes the powder to shift around inside the box. The powder in the box moves constantly and replaces the powder that is being pulled up the tube. This prevents “rat holes” from developing in the powder still in the box. Without constant vibration, the powder would be supplied in surges, which would create problems during application and degrade the finish. 1) Fast Start-Up: Grab a box, open it up, put the pick-up tube in and start coating! 2) Quick Color Change: It takes as little as 3-5 minutes to change colors when using a box-fed gun with air pulse cleaning. Less expensive models may require up to about 10 minutes. You simply clean or swap the hoses, switch to a different box of powder and go back to work. 3) Lower Initial Investment: If you spray a variety of colors and textures each week, the cost of buying multiple hoppers can really add up. Since the powder you buy already comes in a box, there is no extra cost associated with dealing with lots of different powders. 4) More Mobile: There’s less weight to move around your shop when working with a box instead of a hopper on the gun cart. 1) Special Effect Powders Won’t Work: Since the vibratory box feed system tends to cause larger or denser particles to settle to the bottom of the box, any powder that has distinct particle size differences can have consistency issues, especially as you get closer to the end of the box. 2) Humidity Can Cause Problems: To get best results and prevent powder from degrading while in storage, you should keep your powder in a cool, dry, climate-controlled area. If you are starting a new project and you bring powder into a hot and humid shop environment, you can encounter troublesome powder clumping due to condensation occurring when the cool powder is exposed to the humid air. IMPORTANT: When working in hot or humid environments, bring out a box of powder a couple of hours before you need it and open the top to allow the powder to acclimatize to the environment before you start spraying with it. 3) Spillage And Contamination: Although it isn’t easy to do, you can tilt the gun cart by accident and spill the powder out of the box. You can also get contaminants in the powder if you try to reuse spilled powder, or if you have a dirty shop environment and leave the opened box of powder in use for a long period of time. Wagner hopper-fed powder gun with powder pump attached to a 60-liter stainless steel hopper. A hopper-fed powder coating gun holds the powder in a sealed (usually stainless steel) container that has a perforated plastic membrane on the bottom. This membrane has tiny holes in it that allow compressed air to enter the container and constantly fluff the powder so that it flows around inside the hopper. This process is called fluidization. When you look at the top surface of the powder in a hopper that is being fluidized by compressed air, it should look like it is boiling. If you put your hand in the powder while it is being fluidized, it should feel silky smooth. The compressed air supply to the hopper should be adjusted so that powder isn’t wasted due to excessive agitation/over-pressurization of the container. While some powders require a small amount of venting, you should adjust your system for minimal powder loss, especially if you are reclaiming the powder as an on-going process. 1) Conditions The Powder: The fluidization process helps remove moisture in humid environments by introducing clean, dry air from the bottom of the hopper. IMPORTANT: Never stir the hopper with a stick! It can damage the plastic membrane on the bottom of the hopper, reducing the effectiveness of the fluidization airflow. 2) Mixes The Powder: Fluidization also insures that the powder is thoroughly mixed. This is important if you are regularly spraying river textures or bonded metallic powders, or making a transition from one batch of the same powder to the next. 3) Less Chance of Powder Contamination: The hopper is sealed off from the surrounding environment and each hopper is typically used for only one type of powder. 4) Less Surging: Because the powder is better conditioned, the pump picks up the powder more consistently and the gun delivers it more uniformly. 1) Increased Cleaning Time: If you have only one or two hoppers for all of your colors and textures, it can take a significant amount of time to switch between colors or textures—up to one hour per change if done meticulously. 2) Cost/Storage Issues: If you buy multiple hoppers to accommodate all of your most commonly sprayed powders, it can be costly. It can also be challenging to store hoppers when they are not in use. You may end up using valuable floor space to store empty hoppers, particularly if you don’t normally carry some common powders in inventory and get them on demand from your powder vendor. 3) Reduced Throughput: If you commonly have to move the cart around a good bit because of the size or complexity of what you are coating, having a hopper-fed gun can slow you down. A gun cart loaded with a full 60-liter hopper (the most popular size) can be a bit unwieldy. Which Powder Coating Gun Is Right For You? Depending on your work environment, getting the right configuration can make a significant impact on your performance. If speed (how fast you can get started on a new project), agility (how fast you can change colors or textures) and lower cost are key concerns, a box-fed gun may be the right choice for you. If premium finish quality is the most important goal, a hopper-fed gun is probably the right tool for the job. 1) Job Shops: If you spray different powders for different jobs, guns that are box-fed let you change colors quickly between projects. 2) Regular Powder: If you don’t do a lot of special effects, box-fed guns work fine with most single color powders. 3) Small Powder Runs: If you only powder coat a small number of parts the same color during the week, a box-fed unit is perfect for projects where you’ll only be running a few pounds of a specific powder at a time. 1) Limited Color Applications: If you only use a handful of different powders, a hopper-fed gun is usually a better value. 2) Special Effects: As noted before, if a special effect powders are an important component of your process, having a hopper dedicated to each of these powders would be best. Special effect powder must remain fluidized to be applied properly, and a box-fed system simply won’t cut it if you need professional quality results. 3) Reclaim: If you reclaim your powder, you’ll need a hopper-fed gun. The hopper-fed system enables you to mix reclaimed powder with new virgin powder perfectly. IMPORTANT – If you are new to reclaiming spent powder, a ratio of 60% virgin to 40% reclaimed powder is a good starting point. 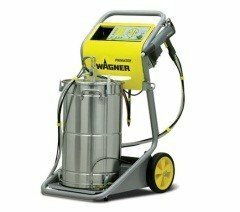 4) Humidity Issues: If your powder’s characteristics or your shop environment causes clumping due to humidity, using fluidized hoppers will usually cure this issue if you have an air dryer attached to your shop’s compressed air supply. With either feed system, you can be successful powder coating a wide range of substrates with multiple types of powders. If you decide on a box-fed system first, you can always add a hopper later. With most professional quality systems, a hopper can be attached right to the box feed controller and only requires a small fluidizing air tube attachment. Although it may cost a little more to have your gun configured this way, it enables a single gun to give you the benefits of both systems. Have questions about powder coating guns? Looking to add a new gun to your existing coating operation? Feel free to give us a call. 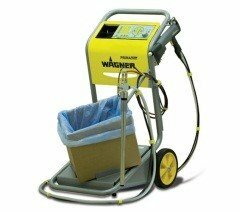 Our systems specialists will be happy to help you get the powder coating gun you need. This entry was posted in News on June 17, 2016 by Bruce Chirrey.